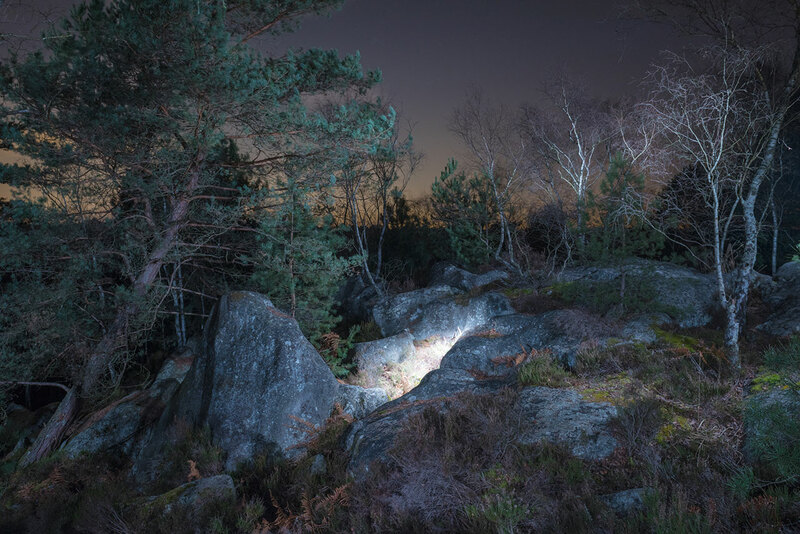 French photographer Alexis Pichot is not one to shy away from challenging endeavours; he left behind a 10 year career in interior design to pursue his passion for photography as a self-taught practitioner so it's no wonder that for his latest project, Marche Céleste, he had no qualms about spending a great many nights alone in the Forest of Fontainebleau, outside Paris. 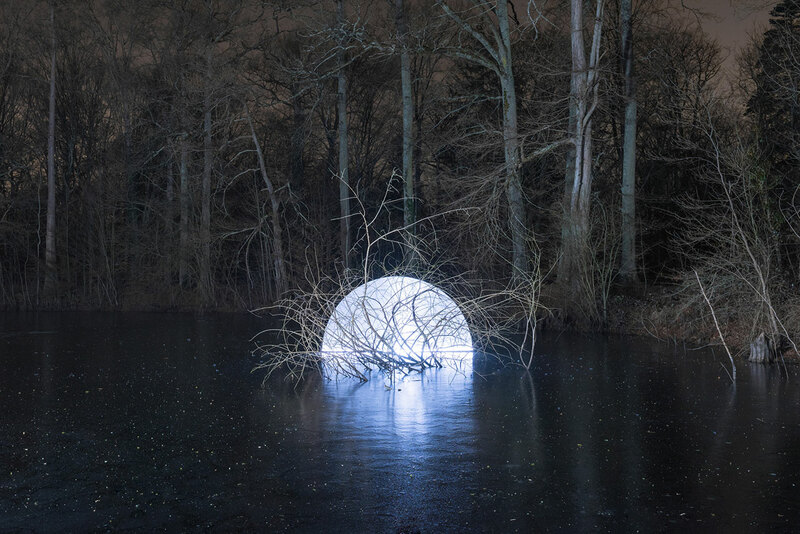 The result of this nocturnal venture is a series of extraordinary photographs that enchant the viewer with their mystical sensibility and the uncanny use of light and lighting. Devoid of any human presence and meticulously set up, the images are eerily lyrical, tapping into the mystery that the forest holds over our collective consciousness, be that through fables and myths or our primordial attachment to nature. 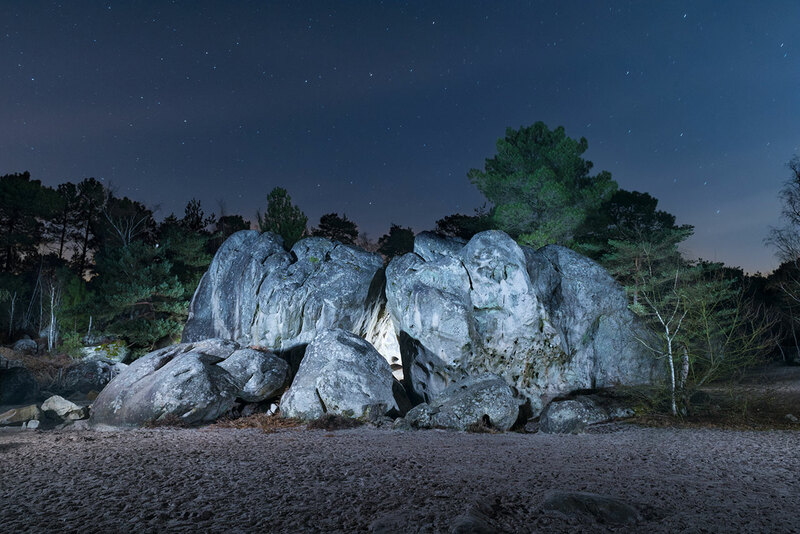 Accompanying the series, a video by Maximilien Franco, filmed over three nights in Fontainebleau, poetically portrays Pichot's night-time immersion and creative craftsmanship. 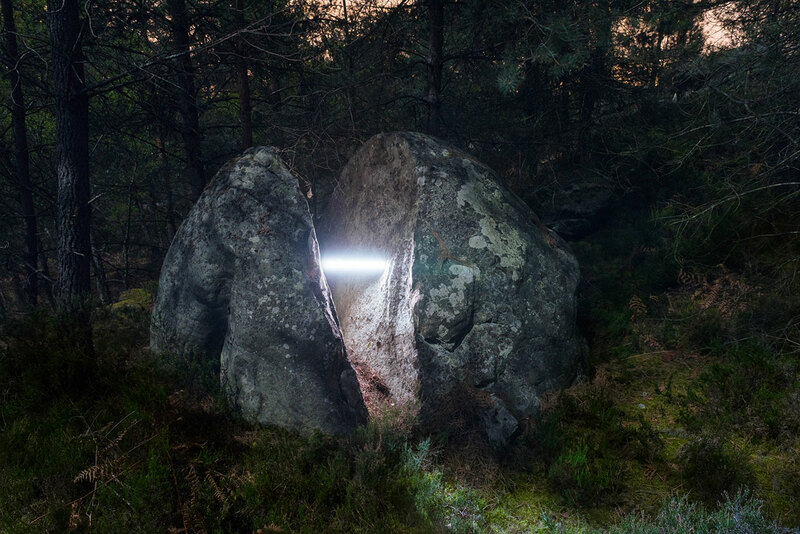 Yatzer talked to Pichot about his project, his fascination with Fontainebleau and the challenges of night photography. What inspired you to abandon your interior design profession and turn to photography? How did your background in interior design influence your work as a photographer? I was working in a company as an interior designer when I realized that the value of my involvement was not fully recognized. During this time of uncertainty, I worked more intently on my nocturnal photographic work. My passion for the impact that light can have on space has nourished my photographic experiments, most importantly through the use of fire, fireworks and electric light. I felt revived and full of emotions. Moreover, as the sole decision maker, I was completely in control of my artistic choices. How did Marche Céleste come about? How did its title emerge? I have photographed many cities and their abandoned industrial sites, fertile grounds for a photographer thanks to their exceptional architecture and atmosphere. From time to time, I had also taken photos in nature which brought me a lot of pleasure but I had not yet given myself the means to deepen the subject. In 2015, I felt the need and the desire to fully discover the world of the night forest, to go alone and face my fears. The title came about after several months of reflection. I tried out many words on paper to get a sense of which ones felt right. Then one day, my partner Isabelle Chapuis, who is also a photographer who often asks me questions and shares her feelings with me, put together those two words from my list and the title was born! 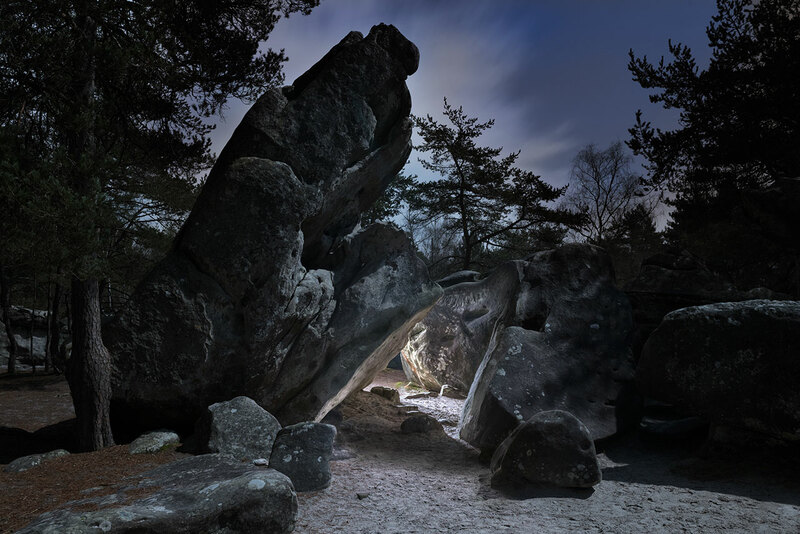 What attracted to you the Forest of Fontainebleau? Did it speak more to your artistic or spiritual preoccupations? I already knew the forest of Fontainebleau as a climber. 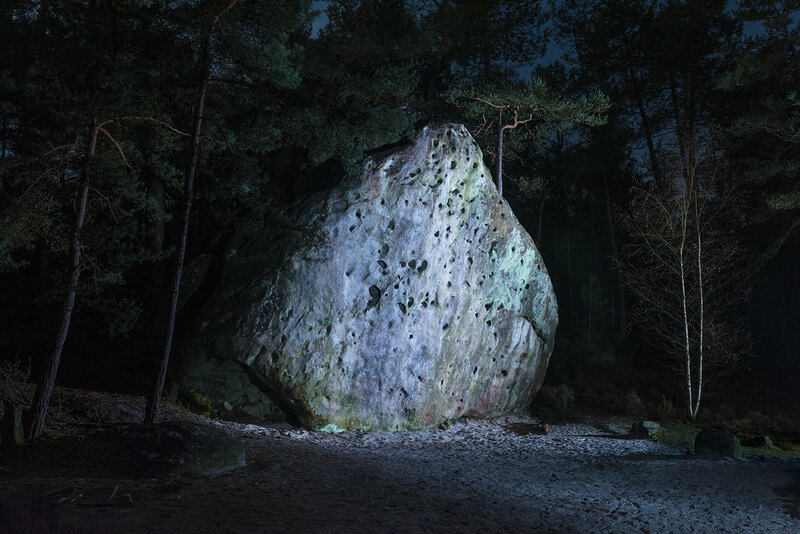 This forest, one of the biggest forests in France and the first protected natural space in the world, is world-famous for its boulders. It was also classified as an artistic reserve in 1863 thanks to the painters of Barbizon school. The forest reveals a diversity of incredible landscapes, part forest, part rock terrain and part sandy plains—Fontainebleau’s sand is one of the purest in the world, composed of 97% to 99% of silica and it is used by the glassmakers of Murano in Italy and by the fibre and optical glass industries. Although I didn’t immediately feel the forest’s spiritual aspect, it definitely lingered in the depths of my consciousness. Then, as my explorations progressed, it grew on me. A film inspired by the photographic project of Alexis Pichot. 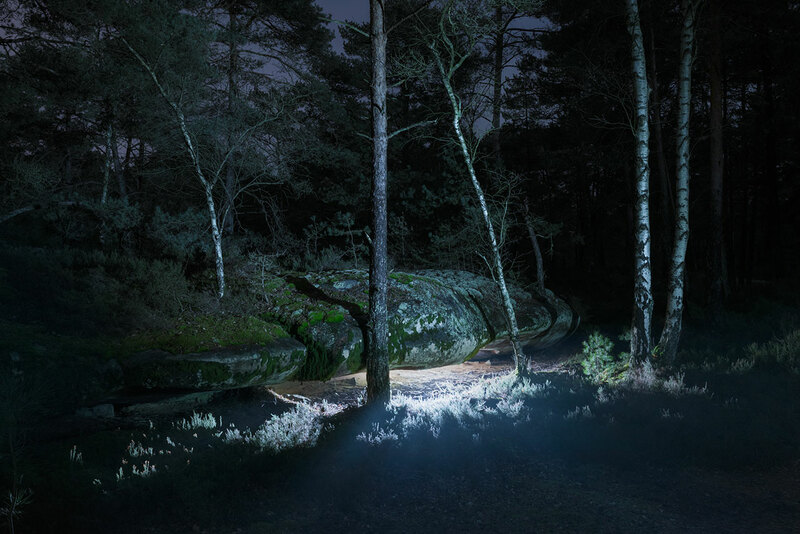 Shot in the forest of Fontainebleau in France over 3 nights of immersion with the photographer in the nature. Directed, filmed and edited by Maximilien Franco. Produced by La Maison Noire. Shot with a Sony Alpha 7S II . Marche Céleste took more than a year to compete. How often did you visit the Forest of Fontainebleau and how much time did you spend there each time? What kind of challenges did you encounter? 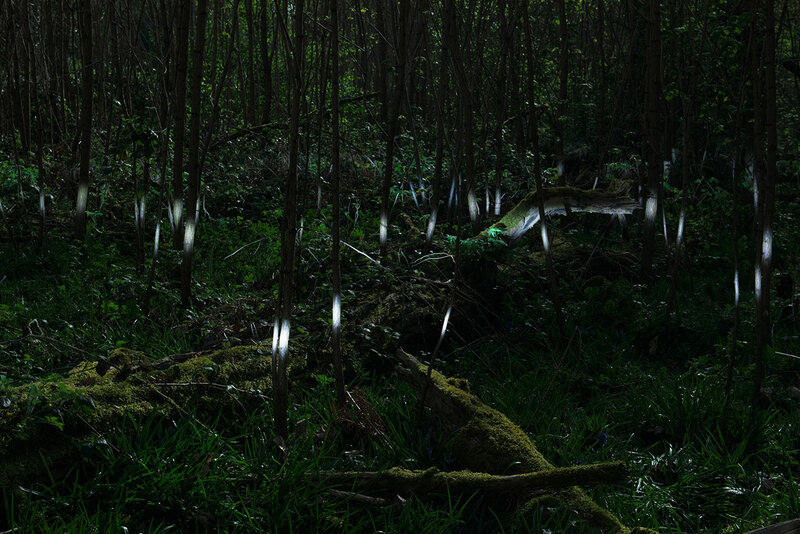 The series is spread over almost two years but my expeditions took place in the winter when the nights are longer, the bare trees branches look like lace, and it is cold and humid; the latter an important and modifying factor in the diffusion of light. In my opinion, these are ideal lighting conditions. In total, I spent 50 nights in the forest. I tried as often as possible to spend an average of three consecutive nights there in order to be the most effective and especially to allow myself to be immersed in the energies that circulate there. A night of walking and shooting in the forest was usually spread over a period of 6 to 7 hours. I regularly encountered animals such as wild boar and deer. At first I was uneasy because I could only hear them, then I quickly realized that they also felt a form of apprehension towards me so I felt more comfortable as I went along. There were moments when I felt subtly connected with the surrounding elements and I could sense the strength of the forest’s energies. These moments could be welcoming or uncomfortable. One night, I had just gone into an undergrowth and felt immediately ill at ease to such an extent that I could not continue and had to leave the forest. Tell us about your modus operandi as a photographer. Do you plan ahead for each shoot, with a precise picture in your head of the image you want to create, or do you mostly experiment on site? I work a lot on instinct and on how a landscape makes me feel. Very often, it is the moment I find myself at the heart of the scene when my luminous interpretation is conceived, which requires a certain diversity in my lighting tools! But obviously, I also have very specific images in mind and search for the right place to express it. What kind of lights and props did you use for the series? How different were the tools and techniques you employed in the forest from those employed for the urban shoots? With a few exceptions, my tools are the same as those used in my urban series. Going into the details would spoil the magic. However I want to clarify that all my interventions take place at the very moment of shooting, there is no digital editing. Why did you choose to photograph at night? The absence of natural light unavoidably entails the introduction of artificial light which gives you the power to dilute the night’s darkness or use it as a black canvas to draw upon it with light. Is this part of the allure? Since my first photographs, I have been attracted to the night and to long-exposure photography which creates images one cannot see with the naked eye. I have always been fascinated by this surprising effect. The absence of light does not inevitably involve the use of artificial light because you can increase the exposure time to gradually illuminate the scene. However, being able to illuminate the scene with a light source that I hold in my hand allows me to actively pierce the darkness. The moon as a natural light source has been quite present and increasingly pivotal in my photo shoots. Its hypnotic influence connected me in new ways to the natural elements and its light adds another layer to certain scenes. In most of the photographs you avoid a pitch black background, preferring instead to have the sky faintly illuminated by the artificial glow of the city—or perhaps it is the mellow light of dusk or dawn. Why is that? Does it allude to a state of transition (day to night, natural to artificial light), or is it simply an issue of aesthetics? 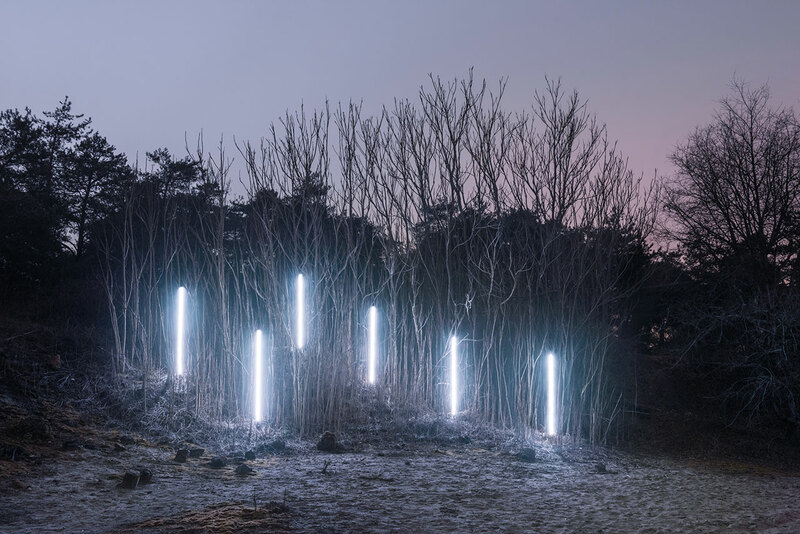 Indeed, the series is articulated in phases, the first representing the entry into the forest through a twilight atmosphere. 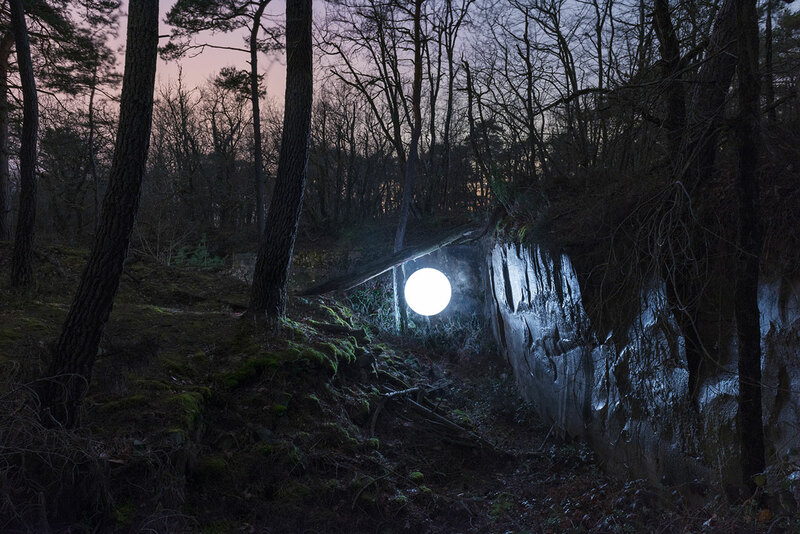 What follows, when I find myself in the middle of the night, is a series of portals (not unlike the clefts between the boulders) that transport me to different emotional levels. 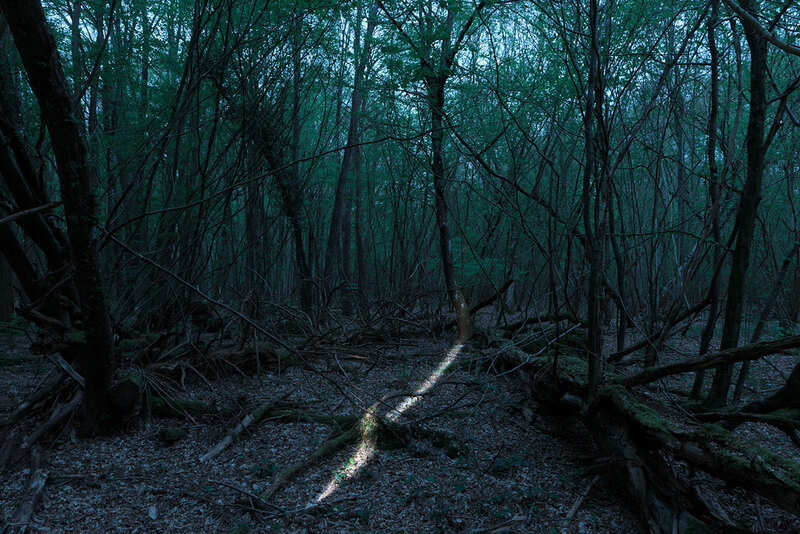 Only one image was made in the early morning, the last of the series, which represents the end of this initiation ritual and the exit from the forest. The forest is one of the strongest incarnations of nature but also a place of transition, a medium to another state for those who immerse themselves in it. Your compositions are characterized by a sense of mysticism, otherworldliness and timelessness. It seems as probable that a druid might appear at any moment as it is for a spaceship to land. What does this sense of mystery signify and how much of your own spirituality is reflected in the pictures? It is an attempt to interrogate the night through physical movement as well as light, which allows us to see beyond the visible, where blackness has not yet absorbed everything. 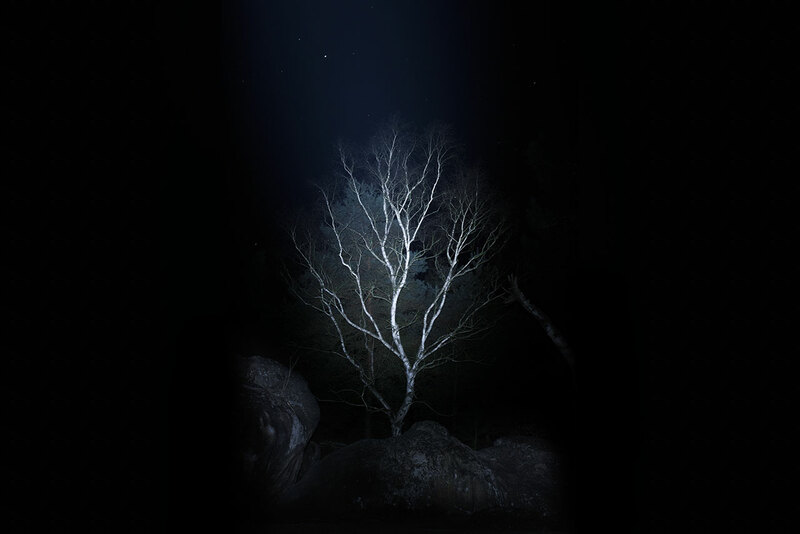 This photographic project was built on my experiences of solitary immersion in the forest where I got the chance to fully live my emotions and express them through the process of staging and shooting photographs. My images fully reflect this notion of a spiritual quest. How did your collaboration with Maximilien Franco come about? In what ways does the video complement your photographs? I felt that video could bring another immersive dimension to my work and perfectly complement my images. So I contacted the production company La Maison Noire and was informed about the work of director Maximilien Franco who is keen on natural environments and nocturnal atmospheres. I felt that our respective fields and shared sensibilities would allow us to make a beautiful video. I believe it is important to find a balance between photography, video and text, in order to offer viewers different readings according to their sensibilities.